Angela Lansbury is a "non-singing character actress." So sayeth Anne Midgette, critic of The Washington Post, in her review of the production of SWEENEY TODD at Wolf Trap. Specifically, she says of "Mrs. Lovett", "This role of the purveyor of meat pies made from the bodies of Todd’s victims is so often given to non-singing character actresses — Angela Lansbury, Helena Bonham Carter — that it’s a treat to hear it done by a real singer." So Anne Midgette, what are you saying it takes to be a real singer? Is one a singer only if one sings operatic or classical musical? Do Broadway songs not count? Are you saying that in the five musicals Angela Lansbury performed in prior to portraying "Mrs. Lovett," she didn't sing either? That's right, five musicals: ANYONE CAN WHISTLE , MAME , DEAR WORLD , PRETTYBELLE , GYPSY plus SWEENEY TODD. She also repriesed her role in MAME in 1983 and also did a short stint as Anna in THE KING AND I. 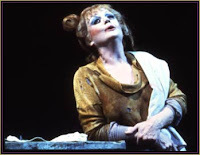 Although I'm no expert, as supposedly the classical music critic for The Washington Post is, I have listened to these five musicals, plus SWEENEY TODD, and I assure you, Angela Lansbury was singing. In fact, she won four Tony Awards these performances: Best Actress in a Musical for MAME, DEAR WORLD, GYPSY AND SWEENEY TODD. She also garnered a Golden Globe for her portrayal of Mrs. Lovett for the filmed production of SWEENEY TODD. The recordings of MAME and SWEENEY TODD also won Grammy Awards. All of these productions were recorded as cast albums, plus most recently A LITTLE NIGHT MUSIC in which Angela Lansbury sings the role of "Madame Armfeldt." She also won the Tony for Best Supporting Actress in a play for the role of "Madame Arcati" in BLITHE SPIRIT (too bad it wasn't the musical version, HIGH SPIRITS, because you know, she would have been singing). Besides singing on stage, you know when she's just a non-singing character actress, she sang in the movies THE PICTURE OF DORIAN GRAY , 'TIL THE CLOUDS ROLL BY , BEDKNOBS AND BROOMSTICKS , BEAUTY AND THE BEAST , BEAUTY AND THE BEAST - THE ENCHANTED CHRISTMAS, ANASTASIA and MRS. SANTA CLAUS . Additionally, she sang at numerous Broadway concerts, on television variety shows such as The Danny Kaye Show, the Julie Andrews Hour and even a couple of times at The Oscar Awards and on Murder, She Wrote. She even sang in a whole concert with the Mormon Tabernacle Choir ! Now, I firmly believe that Angela Lansbury does not need anybody to rescue her from such a statement by Anne Midgette. However, as a fan of many genres of music, including opera and Broadway, I feel the need to point out that there are many types of singing and yes, even character actors can and do sing. Even though, of course, I'm no expert on such a topic, because you know, I'm not hired by The Washington Post to opine. So, consider this, Anne Midgette, the next time you drop somebody's name in your review, perhaps you could check out their profile and work before you write about it. You're entitled to your opinion, just as am I, but I do believe that it is arrogant and ill-informed to say simply announce that someone is a non-singer, especially Angela Lansbury, who of course is, unarguably, an excellent character actress and a singer. Well put...but check this sentence. All of these productions were recorded as cast albums, plus most recently A LITTLE NIGHT MUSIC in which Angela Lansbury sings the role of "Madame Arcati." No problem. I can tell you are fired up! "Oh sing it, Angie, do sing it"
Julie Andrews knows more than the Midgette. Unfortunately we see it often - people who are so educated that they are ignorant. I always thought education was supposed to breed understanding and inquisitiveness for things outside your own circle, but I must be wrong seeing as the fancy shmancy Anne Midget doesn't seem to feel that way. While I'm a huge fan of Opera and Classical, I can't believe someone would be so arrogantly purist as to discount Angela's widely acclaimed singing. It would be like discounting Verdi's work because he veered from the Bel Canto style.